It becomes a tradition, the first new superyacht to arrive on the Côte d'Azur is an Oceanco. It was the case with Sunrays in 2010, or Nirvana in 2012. This year it's the turn of St. Princess Olga. This 85.6m Oceanco superyacht, previously known under the hull number Y708, has now completed her maiden voyage. 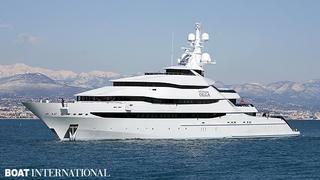 She left the Netherlands last Thursday and arrived today in Antibes. As a reminder, this sleek yacht is designed by Igor Lobanov with naval architecture by Azure N.A. and the in-house team. She purportedly accommodates 14 guests in a master suite and six further guests cabins, configured as two VIP suites with private balconies plus four double staterooms. St. Princess Olga is fitted with twin MTU engines from the 20V 4000 M73L series. Producing 3,600kW each, they are projected to achieve a top speed exceeding 20 knots.